Over the years the railroad ties that held the very large raised bed, known as RING, from falling into the street, had started to crumble. 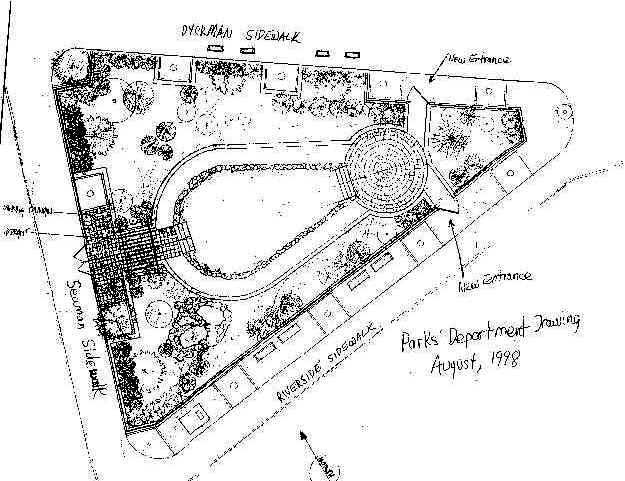 During September of 1995 Maggie Clarke started the process of acquiring funding to replace the rotting ties with something more durable, while at the same time improving the appearance of the garden with a wrought iron fence and making it more accessible to the neighborhood with a couple of additional entrances. At our request, the Parks Dept. provided us with an initial estimate during late 1995 and we went shopping for funds during early 1996. Much to our delight, Ruth Messinger, the Manhattan Borough President, agreed to fund the Parks project from her discretionary capital funds. She provided $215,000 initially, and subsequently, from the 1997 budget cycle, added funds to total $232,000. RING has only an advisory role in what the Parks Dept. does with this funding. We have had one meeting, on March 10, 1998, with the Parks Dept. landscape architects and presented them with the following list. (See 1996 Wish List page.) Parks indicated that work would probably begin during the Fall of 1998. May found us waiting for their response as to the specifics. With the help of the Medical Center Neighborhood Fund, in 1996, RING was finally able to buy key equipment needed to make operational our solar-powered waterfalls. In 1996 RING purchased a 48 watt durable, Solarex, photovoltaic solar panel, a pole mount for two such panels, and a submersible water pump designed to be used with this solar panel. Parks Dept. gave us a 14-foot pole, and pledged to install it at some point. Until then we will experiment with optimal placement to optimize efficiency. Earlier in the year we purchased rubber sheeting to create the upper pond (from which the waterfall will flow), as well as a lined streambed. Since the winter of 1995-6 was so cold and snowy, we lost all the goldfish, but we received more through a donation. We purchased snails to clean up some of the detritus, and water plants for the fish to eat. During the winter we purchased a 1′ x 8′ oak board, stain, gold, green, and orange enamel, polyurethane, and brushes for the entrance sign project which was completed in late May. Also in May we purchased 25 flats of long-blooming annual flowers and two large flats of creeping phlox to enhance further the waterfall area. After the long winter we were unhappy to find that the rat population in our tool shed had burgeoned, and not only were some inexpensive festival decorations destroyed (made into nests), our durable 4-color canvas and nylon 5’x 8′ Festival banner, had several holes eaten out of it. This necessitated finding someone to repair the banner, which RING uses to advertise our festivals to those in the neighborhood who don’t receive our newsletters or see our flyers. Thus, in 1996 we had to do without a banner. We also had to buy several large (ratproof) Rubbermaid plastic storage bins in which to store damageable materials in the shed and in the garden. In the Fall we purchased and planted dwarf iris and crocus to add to our tulips, daffodils, and grape hyacinth. All during the year we purchased hundreds of postage stamps and reams of colored paper on which we had printed four newsletters, and advertisements for two flea markets, a planting festival, a butterfly festival, and a fall harvest festival. Neighborhood interest in RING is highest during our biennial Yard Sales and hundreds of community residents peruse dozens of tables set up by residents to sell used merchandise. Each year this flea market is larger and people in the neighborhood have come to look forward to it. In between festivals, when RING is open on Saturday mornings, an increasing number of residents come through to enjoy the flowers, observe the fish and butterflies, and volunteer. In spring 1996, RING advertised and held three free volunteer gardening workshops attracting 25 people. The garden has become more attractive to neighborhood residents, particularly elderly bench-sitters, some of whom became volunteers, since the police now enforce quality of life laws. Our perennial nesting robins and our butterfly bushes and perennials, which enticed 7 species of butterflies to appear during the butterfly festival, is establishing RING as an unusual nature reserve in the heart of Inwood. Some neighbors come to the garden to see the animal wildlife as well as the plants. RING continues to serve Our Lady Queen of Martyrs school as a science lab. The fact that our garden supervisory staff all have several years’ experience with this site and the plants that grow here, as well as outside teaching experience, has made it possible to train an increasing number of gardening neophytes in the many skills needed to make an urban garden look beautiful. RING has recently organized committees to handle the disparate tasks of garden management and community outreach; some of these are active all year round. If sufficient funding is available, RING’s projects for 1997 include purchase and installation of a second solar photovoltaic panel to augment the power supplied by the first one purchased in 1996, biofilters to clean the pond water, and black Japanese river stones for the waterfall / stream / pond system; purchase of hand pruners and a pruning saw to shape the trees and shrubs which are now seven years older than when they were planted; three soaker hoses for those areas that are hard to water; purchase of a large, durable banner, used to advertise our Festivals to the neighborhood, to replace the one the rats chewed holes into while in storage in our shed during the last snowy winter; purchasing oak wood so that the Arts Committee can make additional signs to identify the garden and its volunteer system to the public; purchase and planting of 25 flats of annuals for Spring Planting and a long folding table to be used as our membership recruitment station during our festivals; and purchase of more paper, postage, labels, and xeroxing for 4 newsletters, five flyers, and communications with volunteers. Also in 1997 we have an increased focus on attracting more garden sitters and gardening volunteers by means of a more vigorous brochure distribution effort and phoning of volunteers.